When you argue/discuss policy with your friends, liberal or conservative, you have an ally in Texas if you are looking for solid facts. Last week the Texas Public Policy Foundation (TPPF), the premier state-based free-market think tank in the nation, held their tenth annual Policy Orientation in Austin on January 12th and 13th. This sold-out event featured stellar and inspiring speakers, and mountains of information relating to the most pressing issues facing Texas and America. Before a recap of the highlights, and especially for those who have never heard of TPPF: visit their website, and read even a smattering of their research papers. This organization is a databank goldmine of policy reviews on substantive subjects ranging from education, criminal law, healthcare, and environmental protection, to juvenile justice and too many more important subjects to enumerate. TPPF’s research, conducted by true experts in their respective fields, enables legislators and all of us to counter emotional arguments for programs, policies and spending, with facts, and offers free-market sustaining alternatives to otherwise ever growing government bureaucracy. Dr. Bill Bennett broadcast his Morning in America radio show from the event, interviewing the TPPF President and CEO Brooke Rollins, Dr. Art Laffer, as well as Wisconsin Governor Scott Walker. Free-market economist Dr. Arthur Laffer, advocate of supply-side economics --whose research and persuasion led President Ronald Reagan to embrace the successful idea of reducing income tax rates to increase tax revenues, proven by what is now known as the Laffer Curve-- participated in a Texas Model Debate with an economist advisor to Vice President Biden, Dr. Jared Bernstein. The issue was essentially the Friedman free markets vs the Keynesian deficit funded models. One nugget from each speaks volumes. Laffer said if you want to see if an economic idea works, reduce it to two people, Farmer A and Farmer B, and the same answer they will come to is true if you apply that idea to all Americans. If you tell Farmer A he does not need to work and will receive unemployment benefits for not working, what will Farmer B do? Laffer of course offered much more in-depth economic analyses, but the “farmer” idea is useful in assessing whether complex ideas will work in the real world market of people’s behavior. Keynote luncheon speaker Governor Scott Walker was inspiring. An honest to goodness profile in courage guy, Wisconsin Governor Walker spoke humbly yet powerfully of the battle in his state that echoes the battle around the country between extremely powerful public unions and the taxpayers. Despite stacks of death threats and union-sponsored chaos inflicted on the State Capitol, Walker pursued in fulfilling his campaign commitments to bring spending and budgets under control, which included in part reining in public union debt, especially that created by the teachers’ unions. Governor Walker faces a likely recall election, as union supporters and Democrats seek to gather sufficient signatures by the January 17th deadline to hold a recall election likely in late spring. If the recall election occurs, the Democrats would put up a candidate also, and the winner would instantly become governor. This race is seen as a test of the strength of the determination on the right to bring public union debt under control, and was described by some in attendance as the “second-most” important election in 2012. Early polling is apparently neck-and-neck. Unions view this as a make or break so reinforcements from around the country are flooding into Wisconsin. Conservative help is needed! Senatorial Candidates’ Debate --Thursday evening. U.S. Senate candidates Craig James, Ted Cruz, David Dewhurst, Tom Leppert and Glenn Addison debated, taking questions from a panel of reporters. Empower Texans co-sponsored the debate. Two websites that offered commentary on it can be found here, and here. 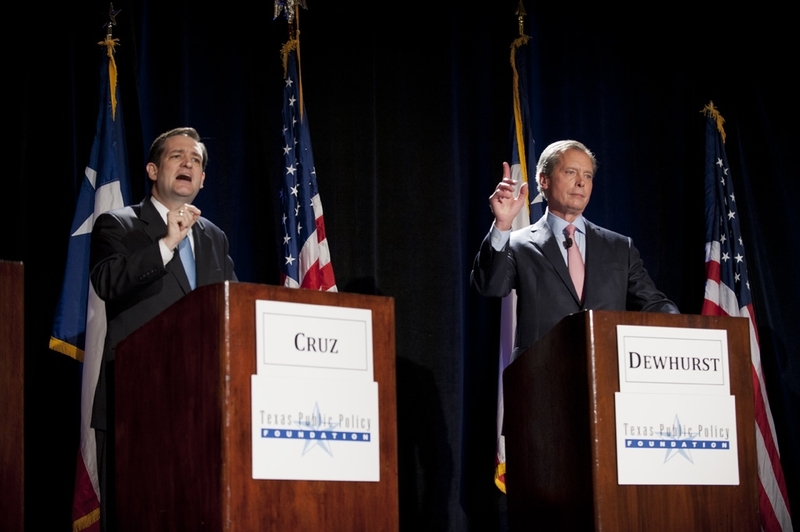 No clear winner emerged but quick highlights are that Cruz strongly inspires the conservatives, Leppert offers the “outsider but with business and political experience” choice with a very specific plan, James is new to this so not so detailed but with plenty of core conservative energy, Dewhurst looked awkward, almost unprepared and disengaged, but was likely chafing under Cruz’s repeated direct criticisms of his record, and Addison is the Ron Paul of the race, meaning anti-Fed and apparently unsupportive of our present foreign policy. Folks mostly left supporting the candidate they were supporting when they arrived. Money and name-recognition matter in all races, and this is no exception. Friday Breakfast Speaker Texas Attorney General Greg Abbott recounted the legal battles between Texas and the ever more overreaching federal government, on issues ranging from EPA regulation to the constitutionality of the mandate to buy insurance that is part of Obamacare. Abbott is a relentless advocate for freedom, states’ rights and the rule of law. He is well loved by Texans for very good reasons. Coach Lou Holtz delivered the Friday luncheon address and was poignant, funny, patriotic, thoroughly captivating and humble. Breakout sessions on substantive topics all day Thursday and Friday morning were SRO. All were fact-filled and seemed to motivate those in attendance to get involved in the fights they care about most. This is an annual gathering, so consider signing up for the 2013 event.